WTH?! articles are supposed to be funny or poignant moments in the game. These days almost every mention is for the lack of focus this Longhorn team has shown. The Horns are out of the Top 25 for the first time in over 10 years. As the season progresses please refer back to my “prediction article” to feel a little bit better. Start of Game (15:00) WTH Sooner Nation?! While signing the national anthem, before the stirring last stanza of this patriotic song, you replace it with “Home of the Sooners.” Isn’t Sooner a description of a cheater than crosses ahead of everyone else to squat on some land? Hey OU fans, I do not think our national anthem needs to be changed. 1st Quarter (14:24) WTH Keenan?! I know that you need to come jacked up to play this game but come on Keenan Robinson you do not need to hit an OU lineman in the back. Stupid is as Stupid does. 1st Quarter (12:23) WTH Oucho?! Sam Acho ridiculous hold/tackle of Demarco Murray was a brain dead move that helped OU continue their drive for an opening touchdown. Stupid is as Stupid does. 1st Quarter (3:46) WTH Monroe?! 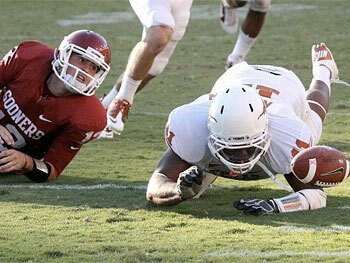 What an electrifying play by DJ Monroe who covered 60 yards for the first touchdown for the Horns. That run was probably faster than anyone since Doak Walker. Sad part was that DJ had only 3 more touches to finish with 68 yards (UT’s leading rusher?!). 2nd Quarter (7:19) WTH Coaches?! The coaching staff gets into the mental midget category with a substitution penalty on an OU extra point. It did not hurt the Horns, but it just shows how little discipline this team has. 3rd Quarter (8:10) WTH Jones 1?! The first real momentum turner was when Eddie Jones recovers a Landry Jones fumble only to have it called back because Eddie lined up offside. Stupid is as Stupid does. 4th Quarter (13:45) WTH Jeffcoat?! Another great defensive stand is wasted when Jackson Jeffcoat decides to retaliate with a cheap shot on an OU player to extend a drive that is capped by a brilliant tight rope walk down the sidelines by Demarco Murray. Stupid is as….you get the idea. v4th Quarter (1:35) WTH Jones 2?! Landry Jones almost gives the Longhorns the game with his butter finger routine with a fumble that lands out of bounds on the 6 yard line. Unfortunately, the final blow was Aaron Williams dropping the OU punt that sealed the game for the Sooners. Next up for the Longhorn’s are the Huskers in Lincoln at 2:30 pm on October 16th.